Lower Back Pain (LBP) is the second most common neurological ailment in the United States after the headache. It costs over $100 billion annually in treatment and related rehabilitation costs including worker compensation. In fact, it is the most common reason for lost wages and missed work days. Degenerative Disc Disease (DDD) is the major abnormality that causes LBP. Moreover, Magnetic Resonance Imaging (MRI) test is the main clinically approved non-invasive imaging modality for the diagnosis of DDD. However, there is over 50 % inter- and intra-observer variability in the MRI interpretation that urges the need for standardized mechanisms in MRI interpretation. 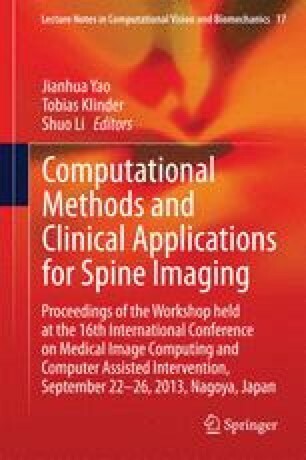 In this chapter, we propose a Computer Aided Diagnosis (CAD) System for Disc Degenerative Disease detection from clinical Magnetic Resonance Imaging (MRI). This CAD produces a reproducible and clinically accurate diagnosis of the DDD for lumbar spine. We design a classifier to automatically detect degenerated disc (also clinically known as Herniation) using shape potentials. We extract these shape potentials by jointly applying an active shape model (ASM) and a gradient vector flow snake model (GVF-snake). The ASM roughly segments the disc by the detection of a certain point distribution around the disc. Then, we use this point distribution to initialize a GVF-snake model to delineate the posterior disc segment. We then extract the set of shape potentials for our Gibbs-based classifier. The whole work flow is fully automated given the full clinical MRI. We validate our model on 65 clinical MRI cases (6 discs each) and achieve an average of 93.9 % classification accuracy. Our shape-based classifier is superior in classification accuracy compared to the state-of-the-art work on this problem that reports 86 and 91 % on 34 and 33 cases, respectively. This research was funded in part by NSF Grants DBI 0959870 and CNS 0855220 and NYSTAR grants 60701 and 41702.